Easter, it's a time to celebrate and have some fun in the sun. Dance, play, and kick your heels up at any of the organised community festivals events, tailor made for us all to enjoy. With most Easter festivals, you can just decide to turn up on the day, immerse yourself in the atmosphere and enjoy all that is on offer. Others however, the more serious events hosting a planned out schedule of music and entertainment, require some advance planning and reservations to confirm your place. With Easter less than a couple of months away, here are some of the best regular events that you can look forward to during this time. The ever popular Bluewater Festival is organised around the start of the Qantaslink Brisbane to Gladstone Yacht race every year. The race has it's start on Good Friday, 29th of March. Roll up with food, drink, picnic blankets, chairs and make yourself comfortable on the shores of Shorncliffe ready to cheer along with the spirit of the sails. The evening prior, on the 28th of March, the festival has Bayfire night. Bring yourself and the kids along to the shores of Shoncliffe (Moora Park), to see the fireworks display at 7.30pm. Arrive earlier for a light bite and enjoy some stalls that will be set up in the late afternoon. Just over the bridge from Sandgate, 'Festival of Sails' draws large crowds of people to the beautiful location of Suttons Beach. 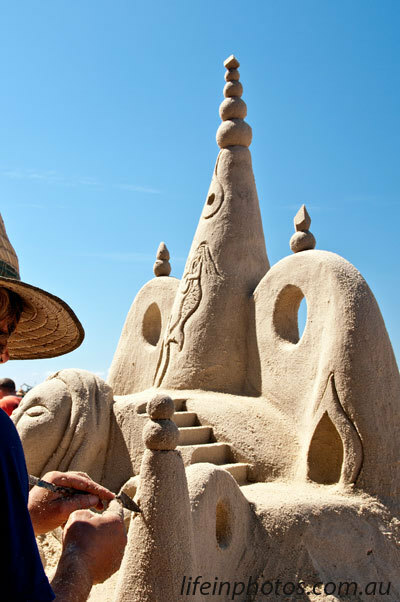 Numerous stalls, entertainment, music and food and lots of activities for you and your family to have fun in the sun and the sand. 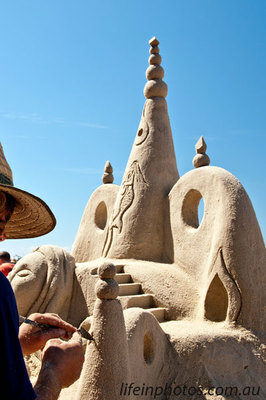 See the sand sculptor build a dream elaborate castle, while kids can try for the same with their bucket and spades. Engage in the excitement as you]watch Easter Bunny from the sky come into landing on the beach with his parachute. Take along your cameras, togs, beach towels, buckets and spades and plenty of suntan lotion Visit the Festival of Sails article for more information. You need to line up and get tickets for this one. It's big, it's busy, it's loud, but it has a vibe and atmosphere and people keep coming back. Music performances are a big part of this festival, however it is more than just music. Find a big exhibition hall, Lifeline's bargain bazzar, artists singing and a kids corner. Hosting such a big line up of artists, you can visit the EasterFest website to see who is performing and click on a preview play of their sounds. Get out there and into this place for some good old fashioned country style fun. "Easterfest is a community based, charitable organisation that is supported by Toowoomba Regional Council, the Toowoomba Police Service and Toowoomba Christian Churches"
For CAMPING UPGRADE and relative prices and program schedule and accommodation options check EasterFest information here.